Pressure ulcers are a significant cause of morbidity and mortality in the aged care population with prevalence rates reported to be as high as 43% in some aged care facilities. 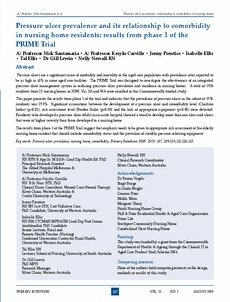 The PRIME Trial was designed to investigate the effectiveness of an integrated pressure ulcer management system in reducing pressure ulcer prevalence and incidence in nursing homes. A total of 1956 residents from 23 nursing homes in NSW, Vic, SA and WA were enrolled in this Commonwealth funded study. This paper presents the results from phase 1 of the trial and indicates that the prevalence of pressure ulcers in the cohort of 1956 residents was 25.9%. Significant associations between the development of a pressure ulcer and comorbidity level (Charlson Index) (p=0.01), risk assessment level (Braden Scale) (p=0.00) and the lack of appropriate equipment (p=0.00) were detected. Residents who developed a pressure ulcer whilst in an acute hospital showed a trend to develop more than one ulcer and ulcers that were of higher severity than those developed in a nursing home. The results from phase 1 of the PRIME Trial suggest that emphasis needs to be given to appropriate risk assessment of the elderly nursing home resident that should include comorbidity status and the provision of suitable pressure relieving equipment.